After multiple leaks in the lead up to an official reveal at E3 2017, we're finally just about a month away from the release of Mario + Rabbids Kingdom Battle for the Nintendo Switch. As the name suggests, this game combines Nintendo’s Mario universe and Ubisoft’s Rabbids, incorporating gameplay not too dissimilar to turn-based strategy titles such as Final Fantasy Tactics and Disgaea. One of the most interesting things about it has nothing to do with the game itself. This is the first time since Super Mario RPG on the SNES that Nintendo is giving another company the reins to its most popular franchise - and that too a non-Japanese developer, Ubisoft. Gadgets 360 caught up with Davide Soliani, Creative Director at Ubisoft Milan to know more about the upcoming game. “We said, how cool would it be if these two universes, that look so different to each other, are really colliding and uniting together," says Soliani. "We really wanted to play around with the contrast between those two universes; new visuals, new game mechanics, new music and a new kind of humour." From this starting point, turn-based strategy wasn’t the first pick for its genre. The game started its life as a multiplayer online battle arena (MOBA), such as Dota 2, and the studio even considered making a real-time strategy game. “It was Mario + Rabbids first. Because, when we closed ourselves in a room with five designers an spent two weeks and a half brainstorming, we came up with 13 ideas," he says. "The first thing we wanted was to play around with this contrast, and to propose something completely new. As we were big tactical players, we started to scratch off all the other ideas until we kept this one." One of the problems with strategy games is that they're typically not as accessible as shooters or platforms. 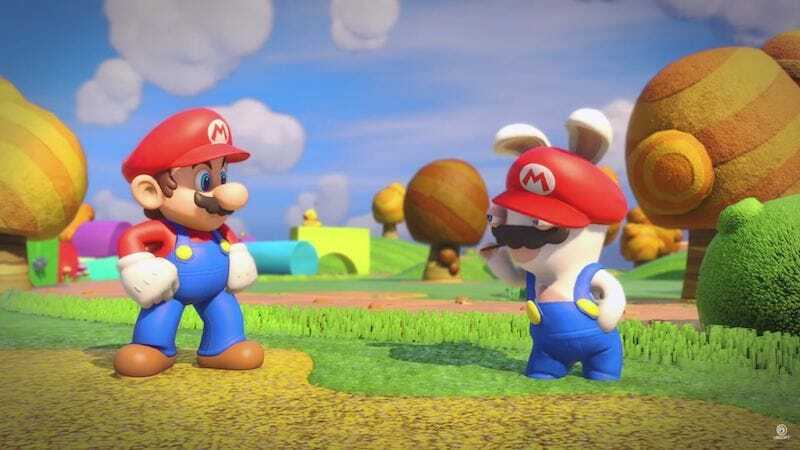 Mario and Rabbids on the other hand are both very noob-friendly franchises. 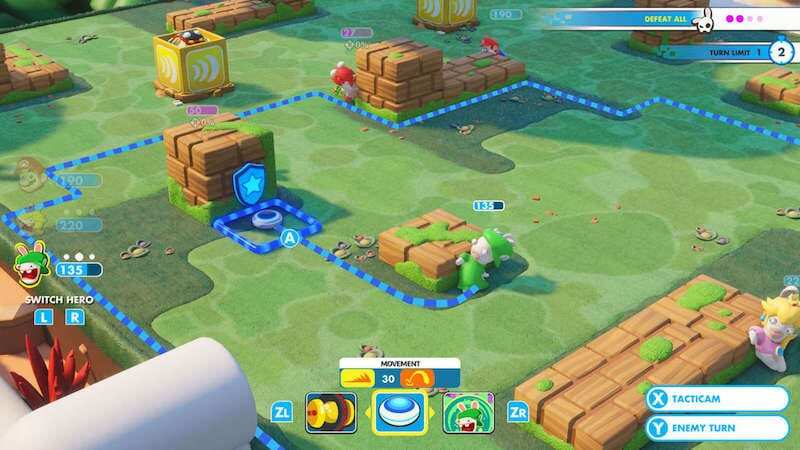 Would Mario + Rabbids Kingdom Battle be a game that anyone could pick up and play, without sacrificing depth or variety? “So, if you play you will notice that, for example Rabbids Yoshi, can run, do a triple dash and then team jump, go behind cover and still the player has a different action to perform," he continues. "Maybe the camera is following the sequence with different angles, in an action-oriented way. All of that, even if it looks complex, is done within the simple impression of a battle, because we are a turn-based game." By moving away from the original real-time strategy or MOBA plans that the team had, the game becomes more accessible, but at the same time, there are enough options available to keep players engaged over time. "We are removing the situation of a real-time game where the player needs to be synchronised with the movement of the character and the camera, because they can spend their time observing the situation, and planning their moves, then press the button to see their execution. And we wanted to do it in a way that was really visually rewarding,” says Soliani. This wasn't the only way in which the game was tweaked to make it more accessible and also fun. Soliani goes on to outline how the design incorporates depth is a number of different ways. “That is why we came up with tools, such as the weapons are not there just to do damage to the enemies but you can apply different super effects," he explains. "So, you can see an enemy running on the battlefield with their bottom on fire, and if it’s running into and touching other enemies, it starts to propagate the fire; the weapons have different statistics too, and later in the game we unlock the Skill Tree which opens up new possibilities to the player." "The combination of all those factors – the synergy between movement and attack technique, the weapons and the Skill Tree – is really giving the depth that we wanted players to have fun with,” adds Soliani. With all this in mind, ensuring that no single attribute, item, weapon, or character is overpowered is no easy task. Soliani says the team runs “many, many playtests”, so that the game is a fair experience for all who play it. While Ubisoft Milan handles the game’s development, Nintendo has played a supervisory role through and through. Mario + Rabbids Kingdom Battle marks the first time the Kyoto-based company’s popular mascot is seen with a gun. Before seeing the light of day, was there any resistance to Ubisoft’s idea of portraying Nintendo's famous mascot with a pistol? The conversation shifts to the Nintendo Switch itself. The console has a touchscreen, but other games, such as Disgaea 5 didn't make use of it, and Soliani says that neither will Mario + Rabbids Kingdom Battle. While the game might be avoiding the touchscreen, Nintendo has shown itself to be more open to DLC and in-game events, as shown with games like ARMS, and Splatoon 2. Ubisoft also has a focus on post-game support and online services, as we’ve seen with Watch Dogs 2 and The Division. Soliani left us with a hint of what to expect.